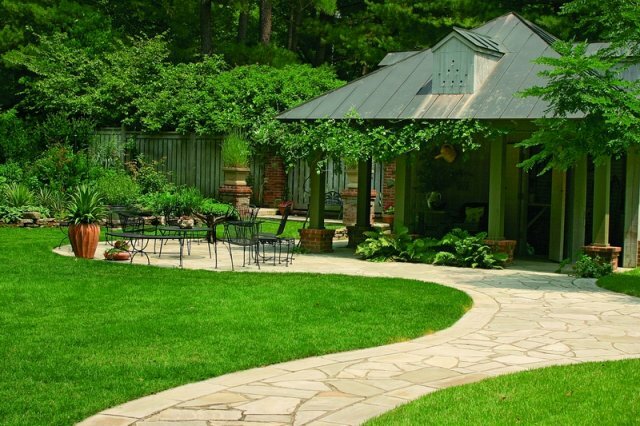 With an adequate base of compacted stone, a patio should last for many years with very little maintenance. There are three conventional categories for pavers: clay brick, concrete, and natural stone. Many types of pavers can handle repeated freeze-thaw cycles while providing an extremely wear-resistant surface. A monolithic concrete slab is more susceptible to cracking than a patio made from individual pavers. Clay brick. Brick is available in many colors and can be set in a variety of patterns. Because they are made from natural clay, brick pavers won’t fade in color and require little if any maintenance. 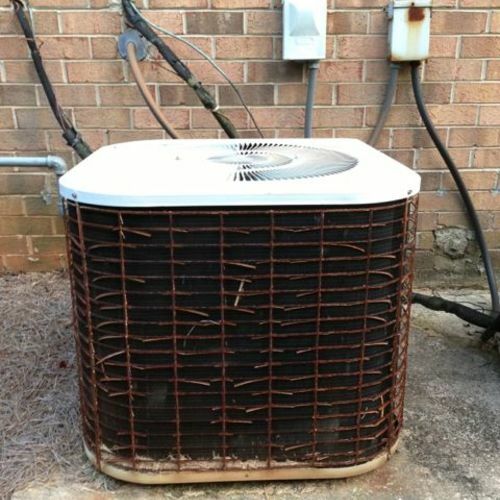 Brick is highly durable and has a slip-resistant surface. Concrete. Less expensive than brick or natural stone, concrete pavers come in a variety of shapes and colors, including styles resembling brick and stone. Chamfered edges allow concrete pavers to be used on surfaces that must be plowed or snow-blown in winter, and de-icing products do not easily damage concrete. 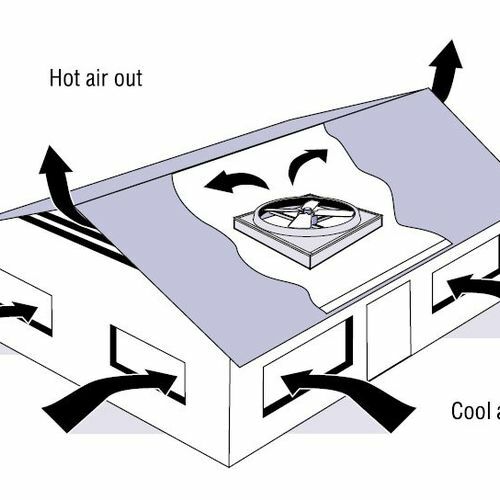 They can be used in all climates. Stone. Bluestone, granite, and limestone are types of stone that can be cut into pavers. Stone is probably the most expensive option, but it is also extremely durable. Colors and textures vary widely. The look of irregularly shaped stones is impossible to produce with manufactured products such as concrete or brick. Plastic pavers. In addition to these familiar materials, at least one manufacturer now produces pavers made from high-density polyethylene (HDPE) that is 100% recycled from postindustrial sources. offers the tiles in four colors and two sizes. Driveways need a slight slope so that they shed water, but too much makes winter driving difficult. The grade should be no less than 2% (a change of 2 feet over 100 feet) but probably no more than 12%. Turning radius is another consideration. This can be as narrow as 15 feet in parking areas for small and midsize cars. But curves on long driveways may require a radius of 50 feet to accommodate fire trucks. Runoff from driveways and sidewalks is far from a trivial problem in suburban and urban neighborhoods where wide expanses of concrete and asphalt produce a great deal of water. Storm drains and waste treatment plants must be designed to handle a lot of water, and runoff also carries with it a variety of contaminants. Plastic and concrete grids are placed on top of the driveway base and filled with gravel or topsoil and vegetation for a surface that resists erosion but still supports heavy vehicles. After it rains, the grid holds water until the water can seep into the ground. Plastic grids are often made from recycled materials and also can be used to reinforce and stabilize driveway bases beneath different finish materials. Pavers. Gaps between pavers let water and snowmelt pass through, so a base layer that drains well is key. Pavers can be made with concrete, brick, or stone. Compared with some other materials, pavers are relatively expensive, mainly because of the labor costs involved in their installation. 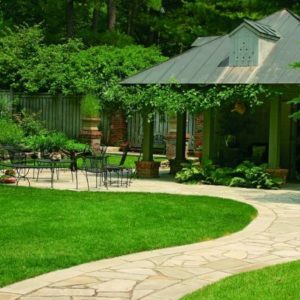 Concrete pavers have a smooth surface, simplifying snow removal, and are available in many colors and patterns. Cobblestones, which are more expensive still, are generally uneven, posing potential problems for snowplows and snow blowers. But the look is estate-like classic. Gravel. This one of the cheapest driveway options, but it’s got some drawbacks. Without a good base and careful grading, expect ruts, potholes, and erosion after a heavy rain, and snowplows probably will push some of the surface stone into your yard. It can be difficult to snow-blow before the ground freezes solid. Fancy grades of crushed stone are better looking but share some of the same maintenance issues. On the plus side, a fresh surface is fairly easy to apply, and gravel often can be sourced locally, lowering transportation costs. Reclaimed asphalt. An option in some areas, reclaimed asphalt is recovered from road rebuilding projects and ground into a gravel-like mixture. It can be spread and packed by hand, or applied with the same equipment used to place asphalt. The material packs tightly to form a durable, wash-resistant surface. Porous asphalt and concrete. Leaving out the fine aggregates in a standard asphalt mix produces a porous surface through which water can drain freely. Durability appears comparable to conventional asphalt, even in cold-weather regions, but the mix is more expensive and not as widely used, limiting availability. One drawback is that the surface can be clogged by dirt and sand, and porous asphalt requires a more carefully designed base that can handle the water runoff. Using larger pea gravel and a lower water-to-cement ratio produces permeable concrete, which allows water to pass through quickly. As is the case with porous asphalt, finding a local contractor may be difficult. Concrete is an impermeable material. More expensive but also more durable than asphalt, it won’t get soft and gummy in the summer. But it’s susceptible to staining and can crack when placed over an inadequate base. Brushing the surface when the concrete has partially cured exposes aggregate for a more decorative appearance, but the treatment also means substantially higher costs and requires a skilled contractor. Concrete can be embossed with a pattern to make it look like pavers. Asphalt is impermeable, cheap, and the least green. It’s composed mostly of sand and gravel aggregate that’s held together with a bituminous (petroleum-based) binder. Although it’s not as durable as concrete, asphalt is more flexible ,so it’s not as likely to crack. Its dark color absorbs heat, so it melts snow faster than light-colored surfaces. Asphalt should be resealed every few years, but it can be resurfaced without tearing up the original pavement. It takes a number of months before asphalt cures, and the surface can get soft in the summer. An interesting nonpetroleum alternative is a resin-based pavement called made by the Soil Stabilization Products Co. It’s produced from pine rosin and pitch and compares favorably with conventional asphalt for hardness and durability. POURED CONCRETE AND BLACKTOP DON’T LET THE WATER SOAK IN. These patio pavers were installed on a well-prepared base topped with compacted stone dust. Storm water will drain through the spaces between the pavers and into the permeable stone dust. Both driveways and patios can be built from a variety of durable materials. A solid base that drains water effectively is a good beginning. Longevity is only one consideration, however. Because driveways and patios often cover significant square footage, they can contribute to runoff problems both on and off the lot. Water that can’t seep back into the ground ends up in stormwater drains and municipal treatment plants. 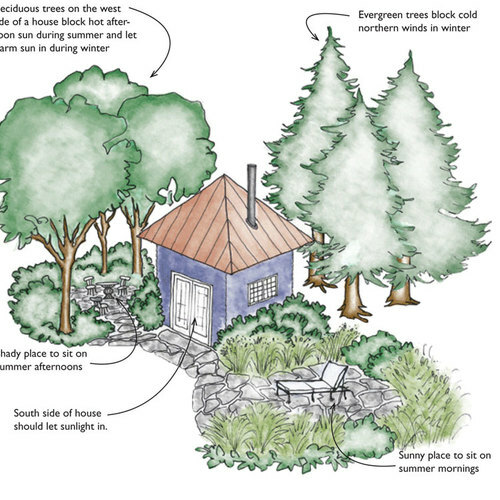 Permeable materials, however, reduce runoff and erosion and help recharge underground water supplies. SOME MEDIUMS SUPPORT GROWTH. As an alternative to using stone dust, you can use sand between stone patio pavers. However, unlike stone dust, sand can support plant life, which depending on the look you want, may or may not be a good thing. Eight inches of processed stone (sometimes called ABC stone or sure-pack) with particles ranging in size from dust to 1 1/2 inches in diameter provides the best base material for stone and paver patios and driveways. Place the stone in several thoroughly compacted 2- or 3-inch lifts and graded at a slope of 1/8 inch per foot so that water drains away from adjacent structures. 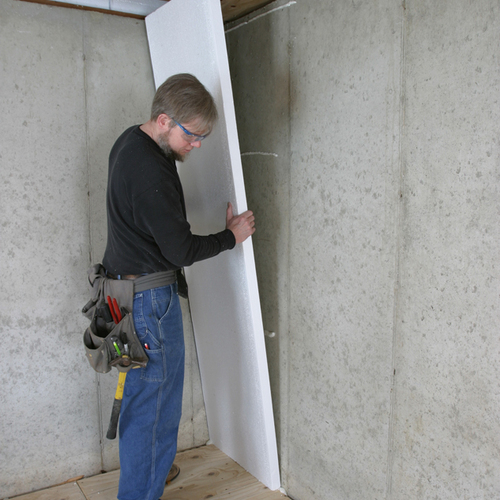 Wetting the material during compaction will help lock together the variously sized particles. 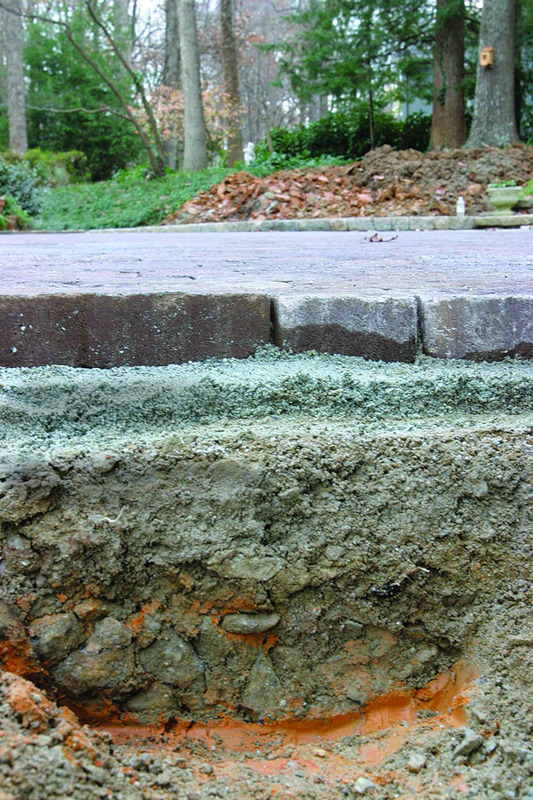 On unstable or clay soil, a layer of heavy-duty geotextile underneath the stone base will prevent differential settling. One inch of course sand place on top of the stone base provides a good setting bed for the pavers. All setting and base material should be sourced locally to reduce material and environmental costs. 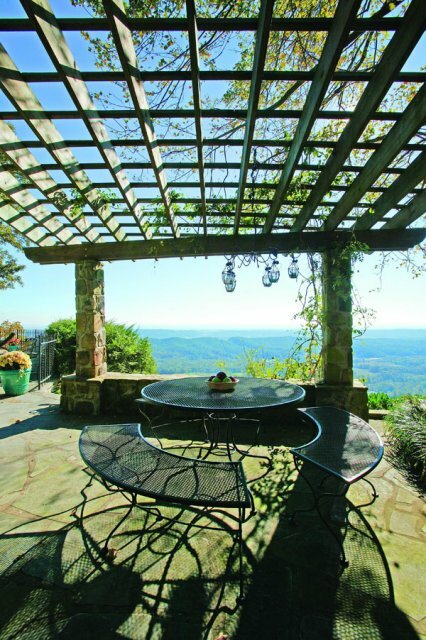 A patio can be more than just a place to park your barbecue grill. 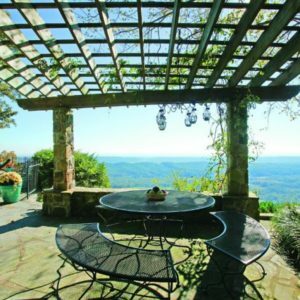 In most climates, a patio could be a valuable living space, at least for part of the year. Consider using dry-laid pavers and complementary plantings, not just for added interest but to absorb stormwater runoff. Consider alternatives to the typical concrete slab. The portland cement in concrete is very high in embodied energy and accounts for a sizable fraction of the world’s human-generated carbon emissions. Therefore, it’s worth looking at concrete substitutes, such as fly ash or blast-furnace slag for portland cement in the concrete mix, and at strategies for using less concrete (e.g., open or spaced pavers). An “old-fashioned” driveway with two concrete drive strips surrounded by strips of groundcover is one possible approach. 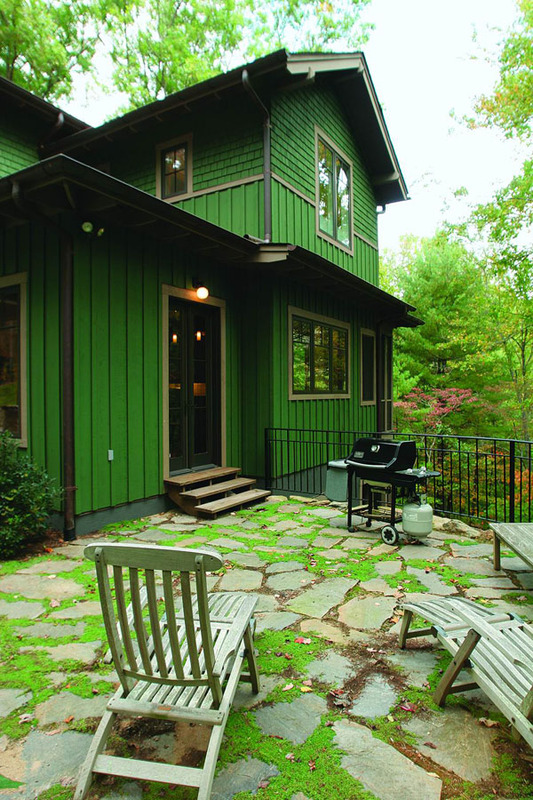 Salvaged stone, “urbanite”, and other reclaimed materials are excellent candidates for patios. 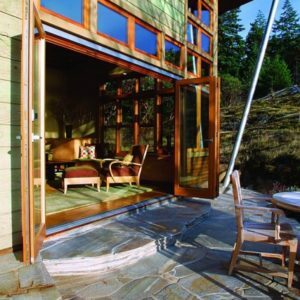 When the weather is nice, a well placed patio can be a seamless extention of the home. 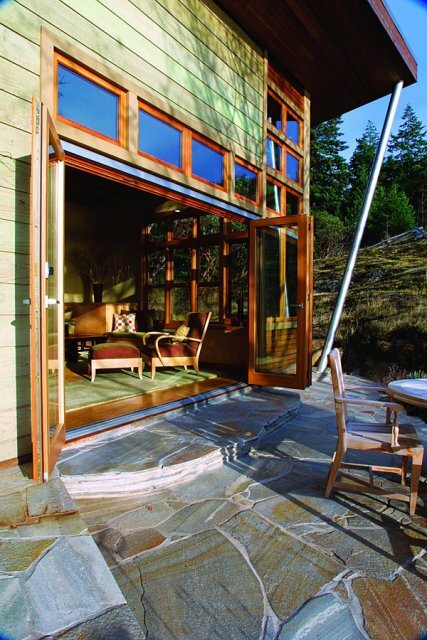 Flowing paths and patios tie the landscape to this home and make it more accessible. 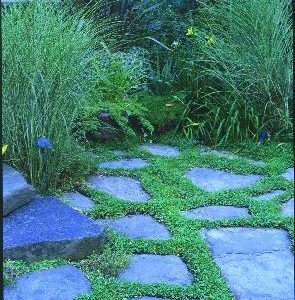 Low growing, walkable groundcovers like this Corsican mint are great for filling wide gaps in a dry-laid flagstone patio. A pergola or trellis can help define a comfortable outdoor space, making it more likely to be used. 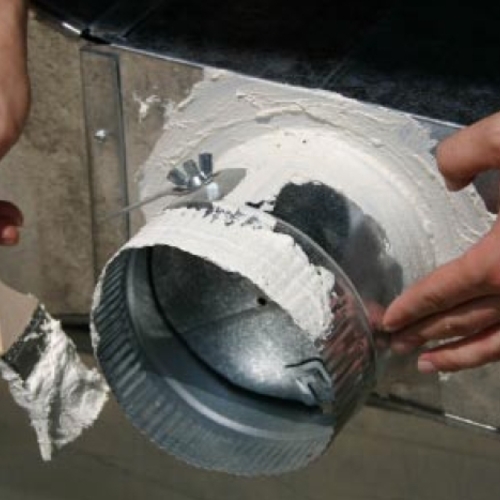 No matter what the finish materials are, the key to a long-lasting installation is careful site preparation. An ample base of compacted stone and coarse sand or stone dust creates a stable foundation that will keep the finish surface flat and trouble-free. A patio laid over soil that contains a lot of organic material or clay won’t last nearly as long. Sub-surface drainage. If the site is prone to flooding or heavy runoff, a curtain drain may be needed to divert water away from the finished patio. Excavation. To provide enough room for base layers, soil may have to be removed from the site. String lines that establish the finish grade and pitch across the width and length of the site to determine how much material must be removed. A depth of between 9 inches and 10 inches below finished grade leaves enough room for crushed stone and setting sand. Coarse sand or stone dust. A 1-inch-thick layer of compacted coarse sand or stone dust over the stone base provides a flat foundation for the pavers. String lines help keep the surface flat and pitched correctly. Add pavers and more sand. Pavers can be laid in any pattern. The surface should be sloped away from the house to promote drainage (1/8 inch per foot is adequate). Once the pavers are in place, spread sand over the surface and vibrate it to lock the pavers in place. While IRC section 105 exempts driveways, patios, and sidewalks from permit requirements, many municipalities have local code or zoning requirements that specify setbacks and construction methods. Additionally, concrete porches and concrete walkways with steps that are exposed to the weather must satisfy section R402.2 and accompanying Table R402.2, which specifies the minimum compressive strength of concrete based on its weathering potential. According to section R506.2.3, polyethylene vapor retarders are not required under concrete driveways, walks, or patios, making pervious types of paving an attractive green option to conventional concrete flatwork. Like driveways, the IRC doesn’t require a polyethylene vapor retarder under patios, provided the space is unlikely to be enclosed in the future (section R506.2.3). This code exception makes the use of pervious paving materials an attractive option for outdoor living space. Because most, if not all, pavers are highly durable, transportation costs emerge as a key sustainability issue. All are heavy, so selecting pavers that are mined or manufactured nearby reduces transportation costs. Natural stone that is quarried regionally is preferable to shipping pavers long distances, even if local choices are somewhat less exotic. Using salvaged brick or natural stone pavers is a better environmental choice than buying new. Landscaping often includes terraced gardens and beds, especially on a sloping lot. 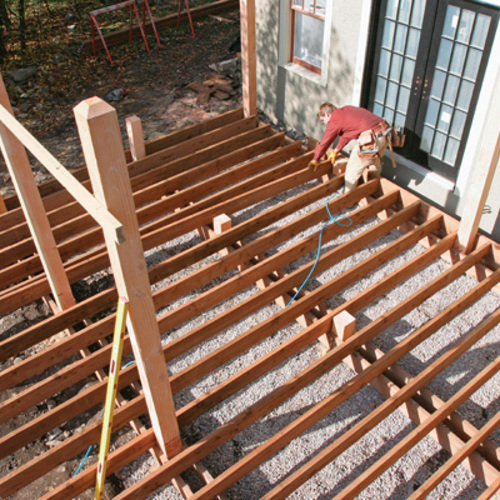 Pressure-treated timbers are readily available, easy to work with and inexpensive. 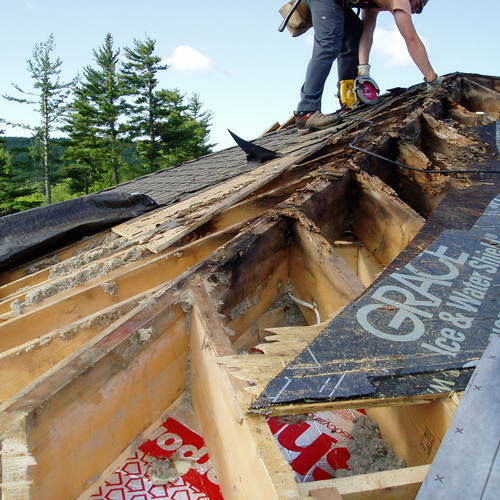 But a more attractive option are timbers made with recycled plastic. Not only will they last longer than wood but they help reduce the amount of waste plastic that goes to landfills. LEED for HOMES Permeable paving can contribute to maximizing the 4 points available in credit SS4 (Sustainable Sites). NGBS Under Ch. 4 — Site Design: up to 5 points for permeable paving (403.5). We recently moved into a house with the concrete driveway sloping into the garage. 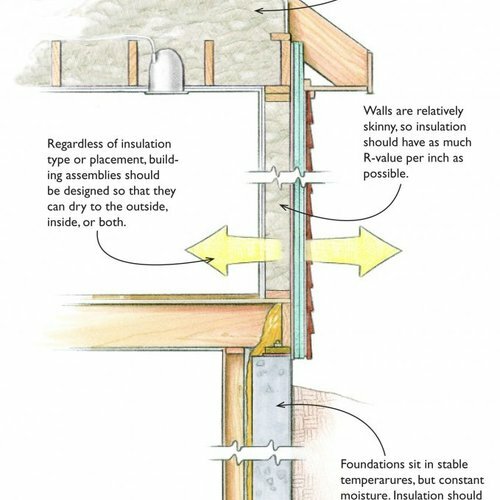 One website recommended using the 'curbs' (like in parking lots) to 'glue' down to the concrete driveway to direct the water away from the garage door. Do you know where these 'curbs' can be purchased? We would like something easy to install and inexpensive. Concrete patios and driveways are long lasting and durable. It is also cost efficient because it last so long. It gives elegant look to outdoor as it comes in various colors, styles and designs.